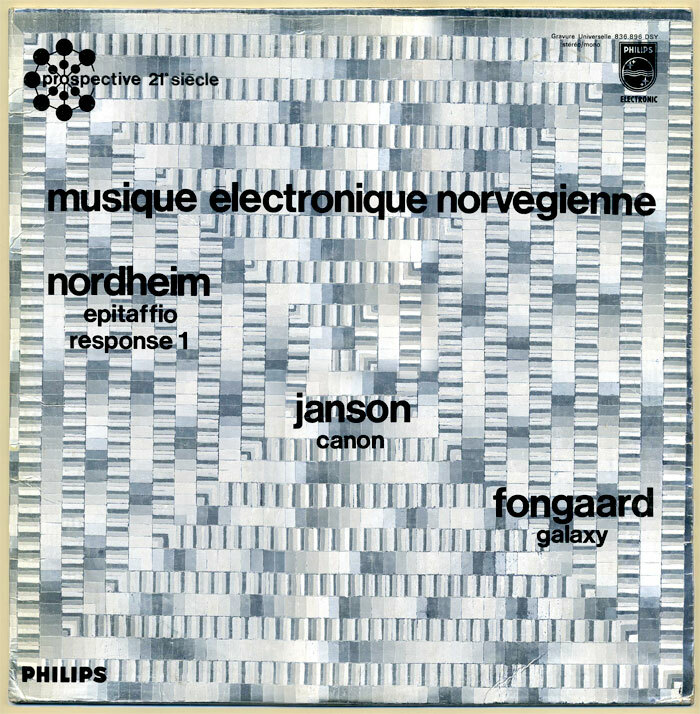 This selection of Norwegian avantgarde compositions from the 1960s was recorded by Norsk Phonogram A/S, the leading record company in Norway at the time, and originally released by Philips France in 1968 as part of the Prospective 21e Siècle series, with a UK version in 1968 as well, and a US reissue on Limelight in 1970 (the label also released Pierre Henry LPs in the US). The Arne Nordheim and Alfred Janson tracks combine live instruments with pre-recorded tape, while the Bjørn Fongaard is for 3 guitars in quarter tone with studio treatments. So this is not strictly speaking Musique électronique, but, back in 1968, electronic music was so hip it was supposed to boost sales just writing it on the LP’s cover. 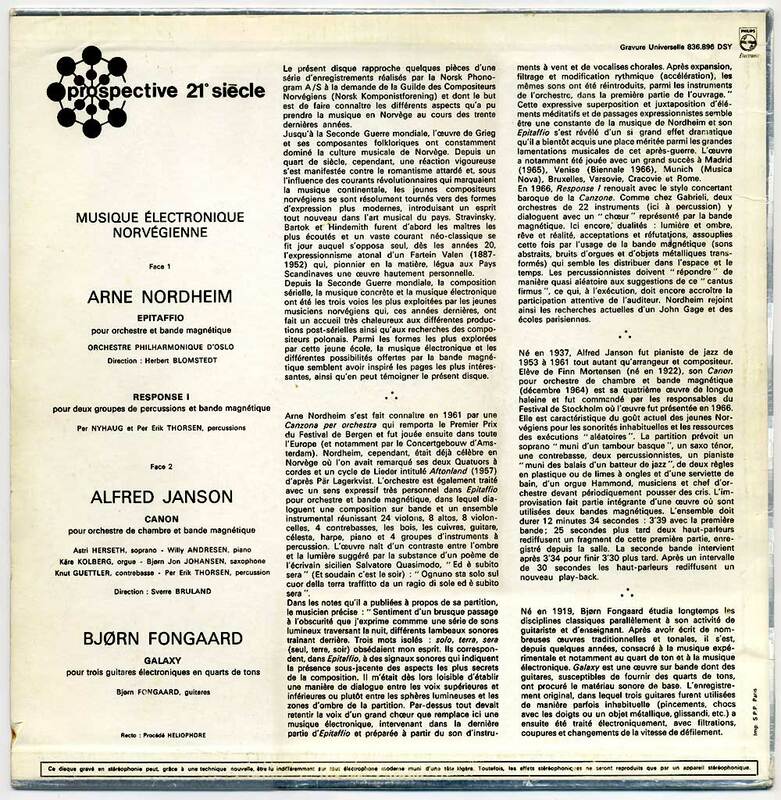 Nordheim’s Epitaffio, composed 1964, and Response I, composed 1966, are engaging contemporary music compositions where pre-recorded sounds on tape (wind instruments and female choir on the former ; abstract electronic sounds, organ and metal objects on the latter) add structure and a provocative counterpoint. 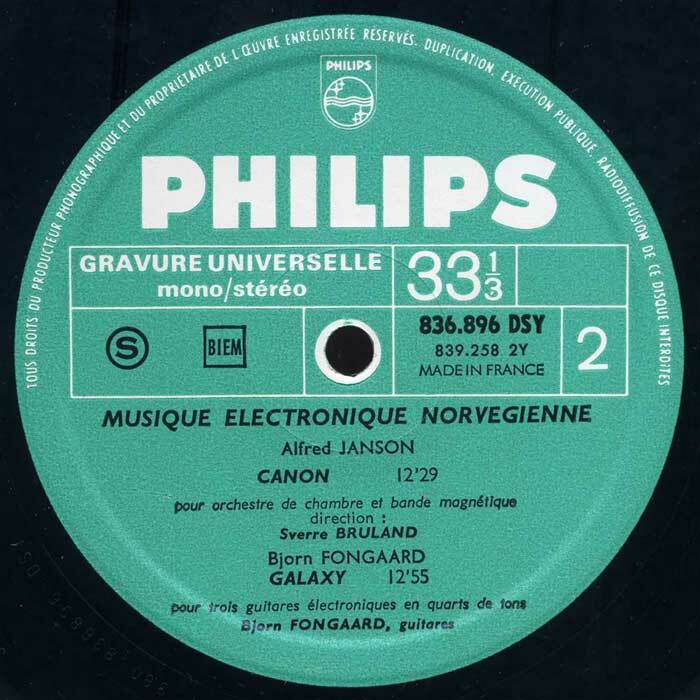 Contrary to the rest of the album, Fongaard’s Galaxy, Opus 49, composed 1965, was recorded by the composer himself through re-recording, and amplifier hum is noticeable throughout. It is nonetheless a stunning piece of microtonal electric guitar and studio effects. The unheard of, eerie sounds of this stellar soundwork can be considered the Astronmy Domine of contemporary music. Don’t leave Earth without hearing it! See also previous post for more Norwegian avantgarde. Note: de-clicking is noticeable on side 1. Oslo Philarmonic Orchestra, Herbert Blomstedt, cond. this collection has a peculiar atmosphere all of its own, i think; stark and cold. Hi, Rob. Thanks for dropping by. While the music on this disc sounds quite unique to me as well, I wouldn’t consider it detached or ‘cold’, especially Fongaard’s Galaxy, what with its amplifier hum, DIY recording technique and cosmic trait. Many thanks for this, good sir. I look forward to listening. Entries from the Prospective 21e Siècle series are hard to come by, it seems. Quite a bit of Nordheim’s work has made its way onto cd (and I must say, I’m a fan), but the other two folks I’m not sure I know. Any way, much appreciated! Gret Music ! thanx !